‘It’s no longer Dairy Milk. It is similar, but not exactly Dairy Milk’. So said Cadbury’s spokesman describing the change of ingredients in the Cadbury’s Creme Egg. Although a great deal of humour and exaggeration has been shared since the announcement, there is a serious note to be struck here, as our BrandIndex data can show. Consumers like tradition, and the humble Creme Egg remains one of the nation’s favourite treats. The simplicity demonstrated in the recipe was almost bestowed on it a sort of sacredness in the eyes of chocolate lovers. More seriously, our data shows the negative impact the announcement has had on the brand over the past week. YouGov BrandIndex Buzz Score (whether a respondent has heard something positive or negative about a brand in the last two weeks) shows a very steep decline in over the past 7 days. On the 7th January, the brand has a modest but positive score of 1.0. On the 15th it has plummeted to a rating of -11.7. It is clearly a topic that has got people talking too. YouGov BrandIndex’s WOM (Word Of Mouth) metric measures whether a responded has heard about a brand from a family member or friend in the past two weeks. On this metric we see a sharp incline, showing that the topic, however jovial and unimportant in the grand scheme of things, is interesting people. 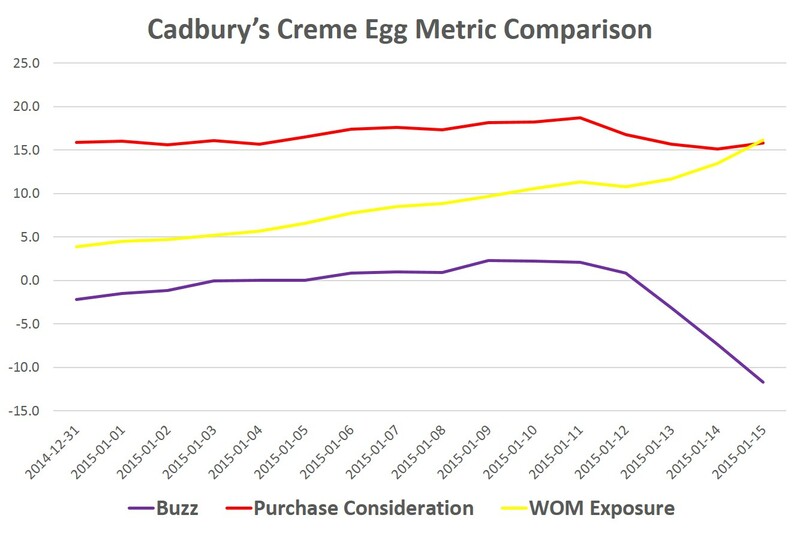 Cadbury Creme Egg’s WOM rating has jumped from +3.9 to +16.2 in the last two weeks, underlying the impact the story has had. So what does this mean in terms of sales, the area the real impact of the change will be found? Bosses will be concerned that less than complimentary press around the new recipe will leave consumers cold on the brand, especially in the run up to the vital Easter period. Our purchase consideration metric (whether a respondent would consider buying the item) shows the beginning of a worrying trend. The purchase consideration score has decreased from +18.7 to +15.2 in the days since the announcement. Of course, Cadbury’s would hope that this damage to the brand is temporary and that they will be able to recover in the coming months. Time will tell if consumers react indifferently to the new recipe and whether the egg maintains a place as one of the nation’s favourites.